Explain the U.S. foreign policy rationale behind the founding of the International Development Finance Corporation (IDFC). The effort to modernize the Overseas Private Investment Corporation (OPIC), creating a U.S. International Development Finance Corporation (USIDFC), began during the second term of the Obama administration. The push was driven by the development community, who saw the OPIC model as outdated and in need of offering more robust support to U.S. businesses investing in emerging markets. But at that time, there was limited political momentum for the initiative and its accompanying priorities. How OPIC went from elimination to super-sized, with the creation of the USIDFC, is a blueprint for how to get things done in Washington, DC. It included skilled politicking by senior administration officials, including OPIC President Ray Washburne, Commerce Secretary Wilbur Ross, and USAID Administrator Mark Green. They, along with others, were able to integrate OPIC’s mission into the defining narrative of U.S. President Donald Trump – his America First agenda and a desire to counter China’s influence. With support from the White House, advocacy efforts unfolded across the administration, Congress and the private sector. 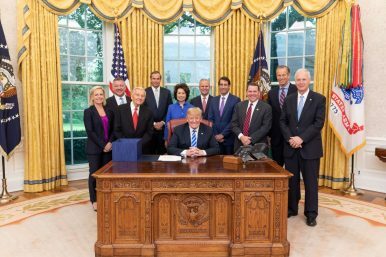 On October 5, 2018, after passing both the U.S. Senate and the U.S. House of Representatives, Trump signed into law the Better Utilization of Investment Leading to Development (or BUILD Act), a bipartisan bill creating a new U.S. development agency. How might the IDFC counter and complement China’s Belt and Road Initiative? The USIDFC will provide additive U.S. government resources to emerging markets, specifically for major infrastructure investments. As reported by the Center for Strategic and International Studies (CSIS), a U.S.-based think tank, the new characteristics of the USIDFC include authority to: 1) make equity investments; 2) provide technical assistance; 3) increase the ability to take smart risks using local currency loans, first loss guarantees, and the provision of small grants; 4) raise the spending cap of the USIDFC’s investments to $60 billion, more than doubling OPIC’s current $29 billion funding cap; 5) provide a 7-year authorization; and 6) create a “preference” for U.S. investors, rather than a requirement. For the past decade, China, along with other BRIC nations, have occupied the infrastructure space, largely to the exclusion of the U.S. public and private sectors. It is estimated that China spends $40 billion per year through its DFIs [development finance institutions], including the Export-Import Bank of China, the China Development Bank, the Beijing-based Asia Infrastructure Investment Fund, the Shanghai-based New Development Bank BRICS, and the Silk Road Fund. The USIDFC can hardly be viewed as a counterweight to these large flows of capital, which often come with an ease of execution and few strings attached outside of debt financing. Rather, it will provide a vehicle for U.S. investors (and others qualifying) to enter markets where commercial investment terms would otherwise make such investments uncompetitive. For the beneficiary nations, it means more competition, more opportunities, and more choice. How might IDFC expand the reach of U.S. soft power? In its own words, the Trump presidency has been about deal-making. The USIDFC will help bring this energy to emerging markets, demonstrating a U.S. commitment to strategic partnerships. The projects supported by the USIDFC will be governed by rules and regulations of U.S. development policy including respect for rule of law, transparency, and environmental and labor protection ̶ all a transference of soft power. According to OPIC’s president, Ray Washburne, this effort shows that the U.S. is “engaged in the world” and that “America First” does not mean that the U.S. is pulling back. He notes that with the new fund, the U.S. will be engaging in other countries in a “businesslike manner” rather than giving aid. How will IDFC function on an operational level? The USIDFC will operate under the leadership of OPIC with expanded staff to address its greater portfolio and new business offerings. The U.S Congress has given the administration 120 days from passage to come up with an operational plan. It is anticipated that it will take up to one year for the USIDFC to standup. Normal OPIC business operations will continue during this transition period. For U.S. policymakers, what are metrics for IDFC’s geopolitical impact? The governing statute which defines the mission of OPIC (specifically to mobilize private capital to help solve critical development challenges and, in doing so, advance the foreign policy of the United States and national security objectives) will remain unchanged. Notwithstanding, the geopolitical impact of the USIDFC for President Trump is more likely to be measured in the number of deals completed and the volume of private sector dollars mobilized.